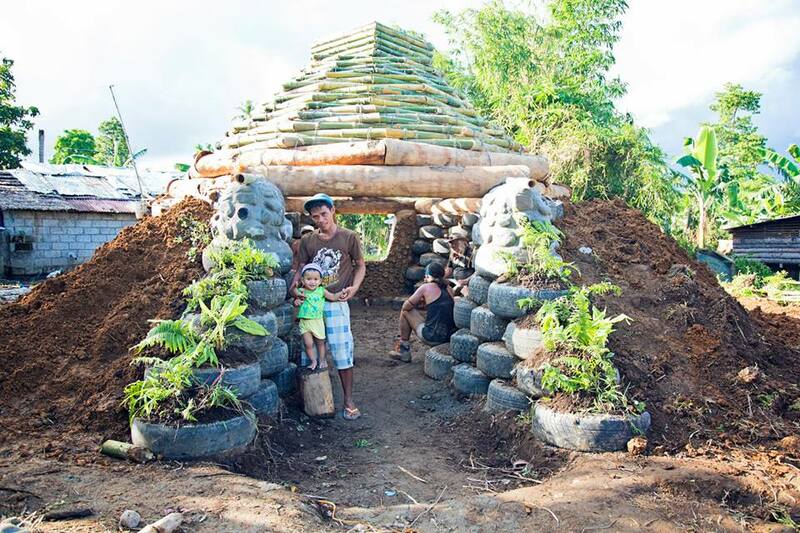 In February 2014, the Earthship crew partnered with local NGOs, Earth Village Project and One Block for Batug, to build the “Windship” in the Philippines as a response to Typhoon Haiyan. The first Windship hit was a 10 day build which established an aerodynamic and resilient structure. The Windship design evolved from the Simple Survival Earthship design and functions as a storm shelter and school building for the Barrangay of Batug in Leyte Island. In February 2015, Earthship joined by a team of local, national and international volunteers returned to Batug for another 12 days to complete the finishes and install the power and water systems. Over the last year the Windship has been used as a storm shelter for the members of the community, demonstrating its ability to withstand the heavy winds generated by typhoons. There has been much interest by government officials as well as the Department of Education in the replication of the Windship throughout the Philippines in the future, which will help to create typhoon resistant, multifunctional use school/community buildings. Between both hits, around 80 national and international volunteers joined the crew learning to build and the design of this model specific for this area and purpose. A local group of 15 volunteers, known as the “Windship 15,” joined during both builds and were trained onsite and educated about the principals of Earthships by the Earthship crew. Along with the completion of the Windship, the team put up a low cost hut to serve as a more affordable building in the community using primarily local resources and recycled materials. The hut was given to a community resident who is also a member of the Windship 15. This hut incorporated materials such as coconut tree lumber, bamboo, adobe, used car tires, recycled glass bottles from local resources. The recipient of the hut, Sandy, plans to use this as a living space for himself and his family while using some of these design principles to help educate and rebuild in the area. All of the volunteers who traveled and dedicated themselves to this project in helping create a lasting effect on an area of the world that has been devastated by typhoons. This project would not have been possible without the amazing teams of volunteers working alongside and assisting our crew. The generous donors who contributed to this project with the short fundraising timeframe we had to launch both phases. The staff of Biotecture Planet Earth and Earthship Biotecture for their time and efforts in organization and building. The members of the Windship 15 and their support for the community, the Earthship crew and the build itself. The Windship 15 eagerly dedicated the time learning the building technologies to ensure the transfer of knowledge and rebuilding in the future. Both partnering organizations, One Block for Batug and the Earth Village Project for all of the needed support to make this project into a reality. Biotecture Planet Earth is continuously supporting this project and you can contribute by sharing or donating. Thank you!